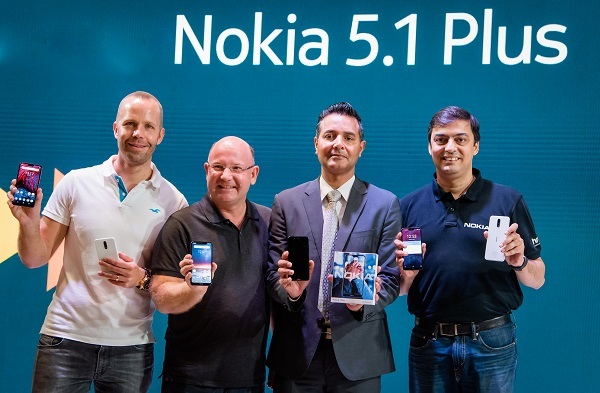 HMD Global, the home of Nokia phones, has unveiled Nokia 6.1 Plus and Nokia 5.1 Plus to fans in new markets. These smartphones bring popular all-screen designs, high-end performance and smart AI imaging features to impressive price points. Thanks to its impressive all-screen design, the Nokia 6.1 Plus gives you a bigger screen experience in a slim and compact package. Its 5.8-inch full HD+ 19:9 screen ratio with 96% colour gamut allows for a vivid viewing experience, making the Nokia 6.1 Plus a perfect smartphone for enjoying immersive content experiences. Beautifully crafted to the exacting standards expected from a Nokia phone, it is encased in glass on the front and back, taking up approximately 93% of the phone’s luxuriously curved surface for the ultimate feel in your hand. Behind the elegant looks, the latest Qualcomm® Snapdragon™ 636 Mobile Platform is 40% faster than the previous iteration of the chipset, delivering first-class graphics and battery efficiency enhancements to ensure you can enjoy your audio and video for even longer. The Nokia 5.1 Plus is powered by the advanced MediaTek Helio P60 octa-core processor usually seen in a higher tiered smartphone. The engine has been designed to deliver precise power to handle gaming, video or multi-tasking applications with ease. The advanced imaging allows you to capture studio style shots with depth-sensing imaging and selectable bokeh blur, as well as portrait lighting. The dual 13MP/5MP rear sensor with electronic video stabilisation ensures that you film steady, sharp videos to perfectly capture your special moments with friends, no matter what the situation is. The stunning edge-to-edge 5.8-inch HD+ display gives fans maximum content with a minimal footprint. The Nokia 5.1 Plus features a pure design with 2.5D curved front and rear glass, complemented by curved edges and a CNC-machined metal camera bezel with optical glass window and high gloss finish frame. At around 8mm thin, the ergonomic design with continuous curvature makes for the ultimate feel in the hand. The Nokia 5.1 Plus’s die cast full metal chassis with a polycarbonate frame is quality tested in extreme temperatures and drop tested to ensure that it meets the exacting quality standards for a Nokia phone. Both phones join the Android One family of Nokia smartphones, offering an experience designed by Google that is smart, secure and simply amazing. Each device will stay fresh over time with three years of monthly security patches and two years of guaranteed OS updates after launch. As with all Nokia smartphones in the Android One programme, you’ll get more battery and storage space out of the box thanks to no additional skins or unnecessary third party applications. And you will stay ahead of the game with the latest Google services like the Google Assistant and Google Photos with free unlimited high-quality photo storage.